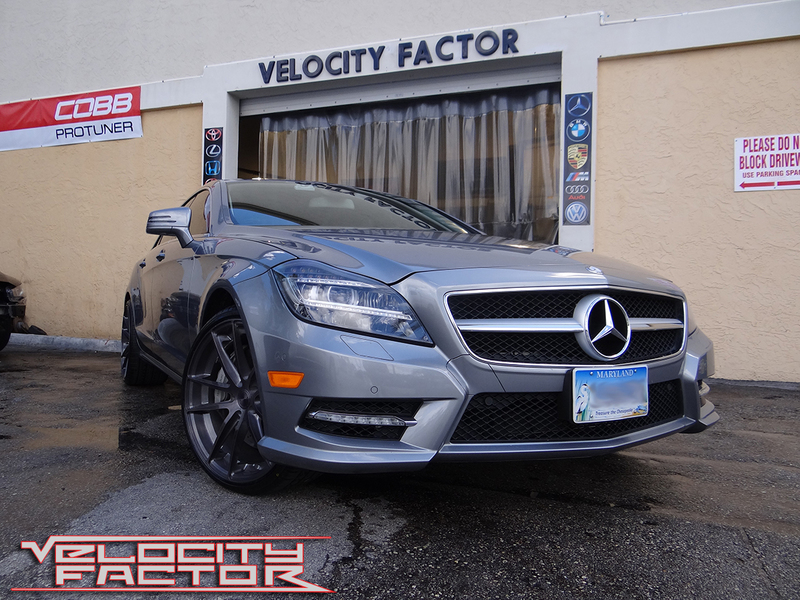 This beautiful, 2012 Mercedes CLS 550 recently rolled into Velocity Factor with its proud owner who’s had the car since new, unsure of whether to keep the car or invigorate some new life into it. With only 80k original miles, it certainly had a lot of life left to give so the decision was made to give the car a full service and some nice upgrades to enhance the performance and overall looks of the vehicle. A full, comprehensive service was performed on the car including a synthetic oil service, flushing of all major fluids (brake, coolant, and transmission fluid), all new filters, and new spark plugs too. Only the best oil and brake fluid was used from Motul, and the coolant utilized was OEM Mercedes. This was the first step in the right direction! With regard to performance, the 4.7L M278 Biturbo V8 has a lot of room to enhance horsepower and torque alike. With the decision made, a Weistec Engineering ECU Upgrade was loaded onto the vehicle along with Weistec high-flow engine air filters and NGK Iridium Spark Plugs that were one range colder than stock to handle the newfound power. When it was all said-and-done, the car picked up tremendous gains and is now making 540 Horsepower and 715 Ft.-Lbs. of torque on 93 octane pump gas! The stock / factory numbers were 402 HP and 443 TQ which made a huge difference! Needless to say, this car was completely transformed as a result. For looks, let’s just say that the stock 18 inch wheels and tires weren’t exactly cutting it. They left huge gaps in the wheel wells and made the car look a bit anemic. At Velocity Factor, we always have a vast array of wheels for almost every application in stock. With that, a set of beautiful Stance SC-1 20 inch staggered wheels that looked phenomenal in both style and color (brushed titanium) were installed with new, wider and more aggressive tires. We think you’ll agree this car has a great, new look that now matches it’s incredible performance. From wheels and tires, to services small and large, to the best performance, brake, suspension upgrades and so much more; Velocity Factor has you covered! Come visit our facility and showroom located at 980 North Dixie Highway in Boca Raton, Florida and meet with one of our experienced, professional staff members who can help with anything you need or want. You can also reach us via phone at (561)-395-5700 or email us at: sales@velocityfactor.net Our hours of operation are Monday through Friday from 10am to 6pm EST and Saturdays from 12pm to 4pm EST. We look forward to hearing from, meeting, and working with you and your vehicle!